Hey! News 24! Its winter and the weather is bad. We've got that (and kind of expected it to be honest). 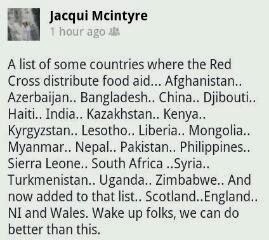 Now, get to reporting some real news like the fact that the UK is one of the countries the Red Cross now delivers food parcels in (see Jacqui Mcintyre's facebook status reproduced below for a list) and tens of thousands more people/families, as a direct result of Tory/Libdem policy (voted for enthusiastically by my MP Jo Swinson), are reliant on food banks (the new name for soup kitchens). Weather and Nigella and Christmas shoppers are much more important than increasing poverty and starvation in Tory UK. But hey! GDP and other figures that show in actual fact, that the rich are getting richer and damn the poor who had no hand in the 2008 economic crash, are much more important! My local foodbank are describing the present situation as "the food crisis." I know they are well meaning, but lets call a spade a spade. This is a crisis brought on by the Tories and LibDems diverting taxes from welfare to corporations, banks and their pockets. Like the Liberals and Tories of the 19th century who starved the Irish poor. The mismanagement of the economy that has led to starving people relying on foodbanks is more than incompetence- it is criminal robbery. "The food crisis" = the tory robbery of the working class. Workers are getting poorer and poorer, and welfare now means "starvation and freezing to death" in one if the richest countries in the world, yet News 24 want to tell us the winter is cold and wet. The UK is definately a cold place for those who work, are desperately looking for non-existant work, are unable to work or have recently lost work.